Twisted Flight is finally here! 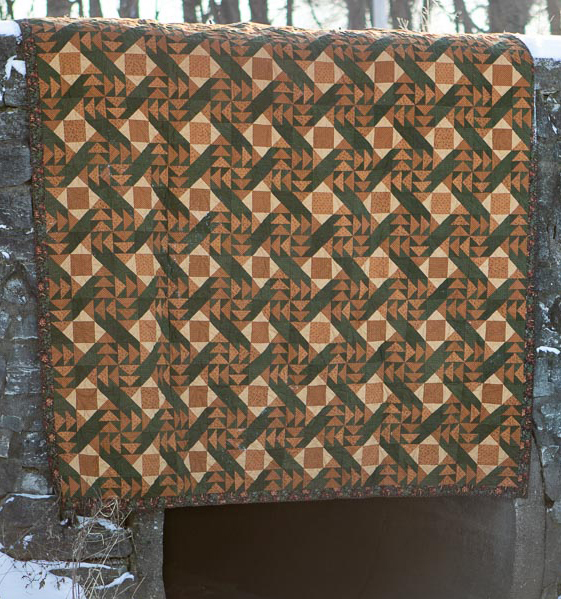 This design uses one block to give you this twisty, turny, pinwheely effect. 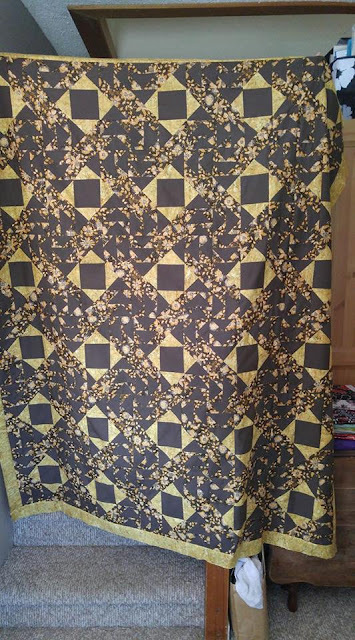 Would you have guessed it was this block that makes up the quilt? Twisted Flight comes with instructions for four sizes: 64" x 76", 76" square, 76" x 100" and 100" x 108"
Let's take a look at what the testers did with this pattern! This gorgeous combination feels so happy. 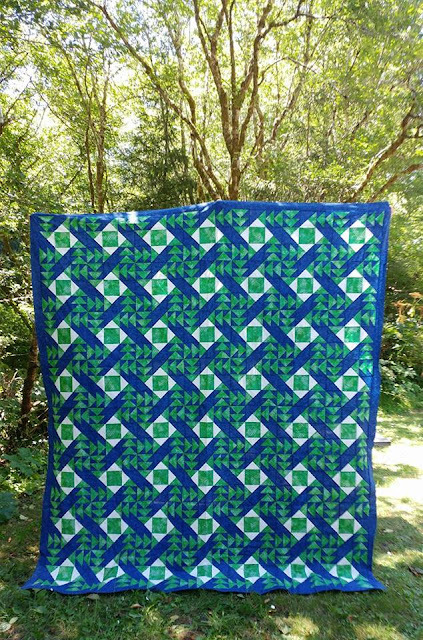 The blue is the perfect color to set off that green. 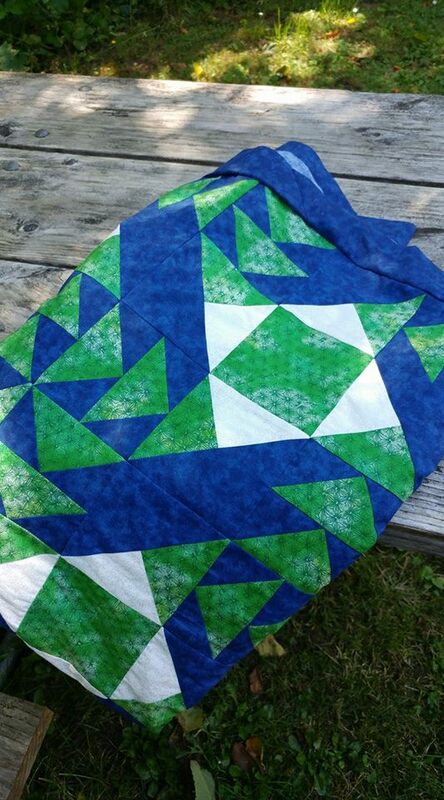 Sherra used a print as her background to her Flying Geese and I love how that sets off the center of each block. 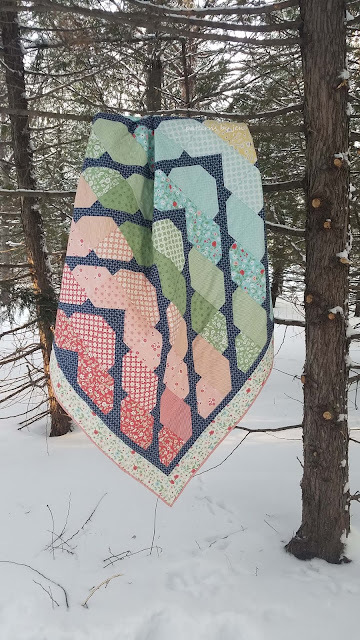 Fawn chose to go gradient with her quilt and it's stunning! Get your digital Twisted Flight at a special "new pattern" price. A printed pattern will be available soon for those who prefer printed. 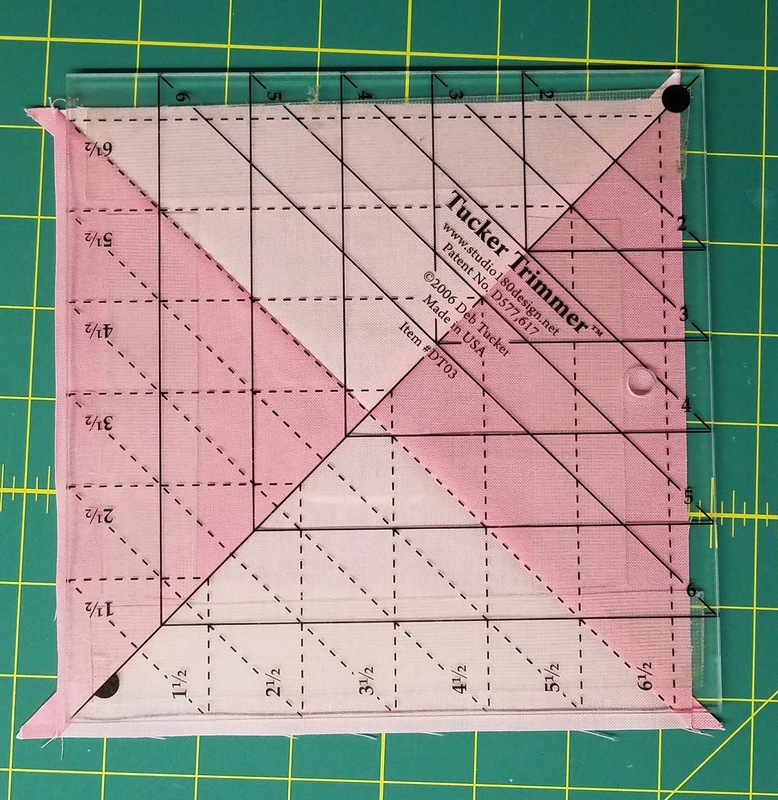 There are two rulers that I recommend for this pattern. 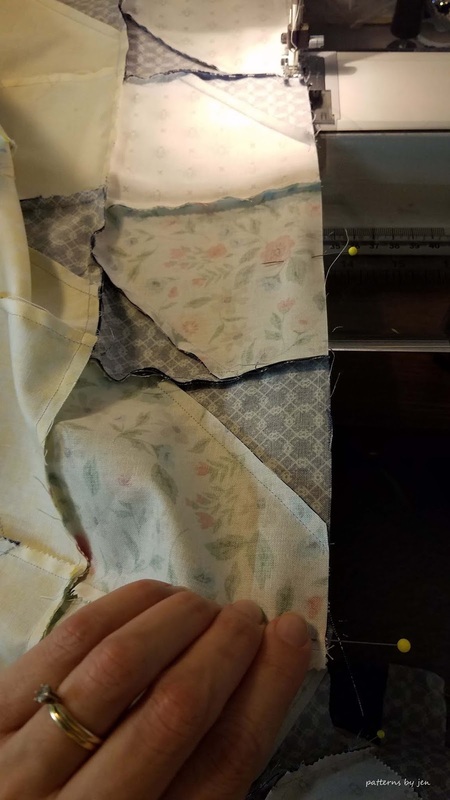 Though they are not required it makes the trimming of the Flying Geese units and Quarter Square units easier. This pattern is for the "Advanced Beginner" meaning there is a little more work with this pattern simply because of the Quarter Square units as well as piecing the blocks together. I hope you enjoyed meeting Twisted Flight! Welcome to the Link Up for the February Color Challenge! 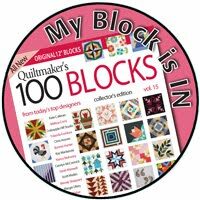 If you haven't gotten your February block yet, it is still free through the end of the month. You can find it in my Payhip store HERE. Each block now comes with a link to a full video how to! You can also have the block instructions delivered directly to your inbox on the first of each month. 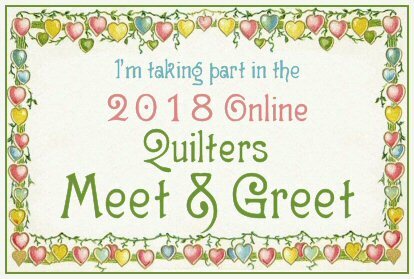 Please make sure to add patternsbyjen(at)gmail(dot)com to your address book so you get the email. If you are having trouble getting the link up to work please read THIS POST. 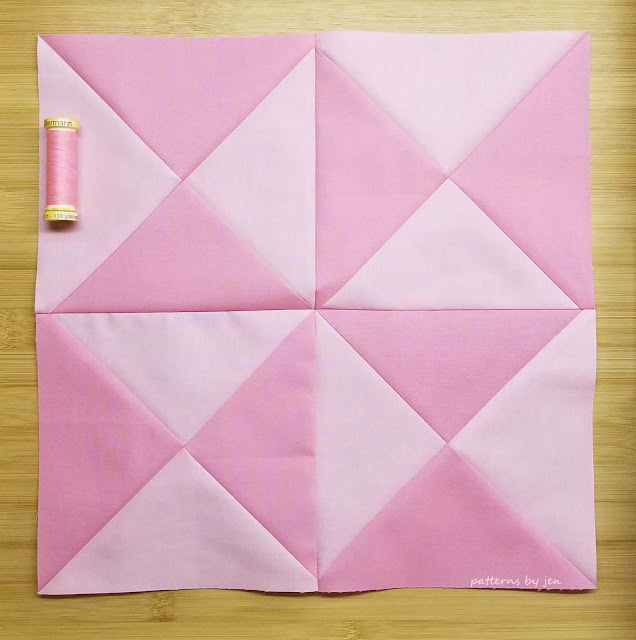 If you haven't already, you can join the Quilt and Learn with Patterns By Jen Facebook group to get inspiration for you blocks as well as tips, advice and encouragement from quilters sewing along with you. If you missed the introduction post you can find it HERE. 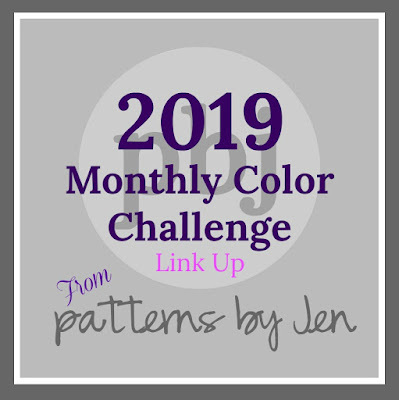 This post will be updated each month with a link to the new Color Challenge post, so you may want to bookmark it. 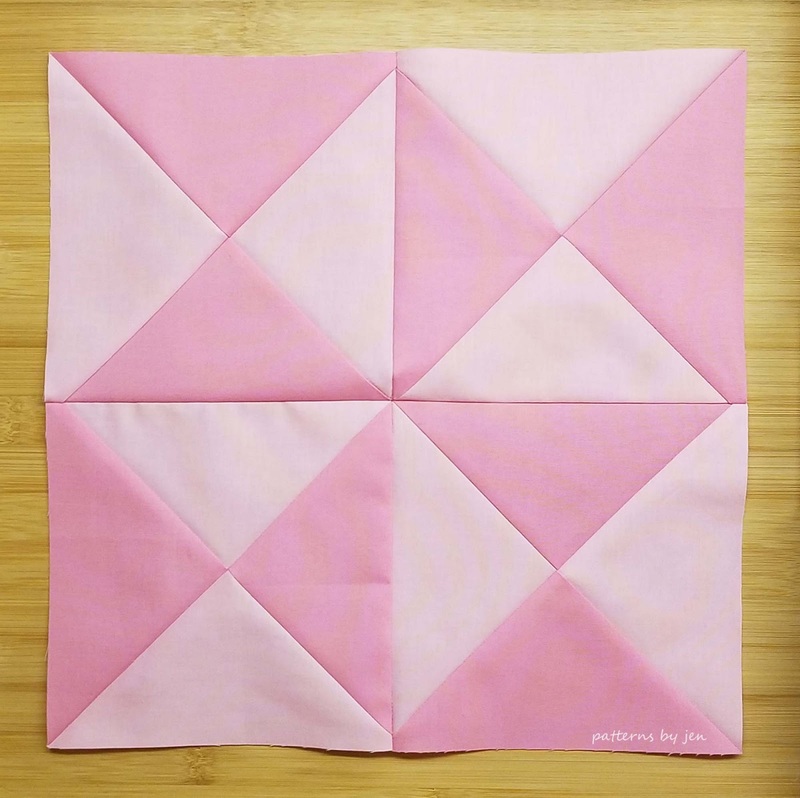 I can't wait to see your blocks! 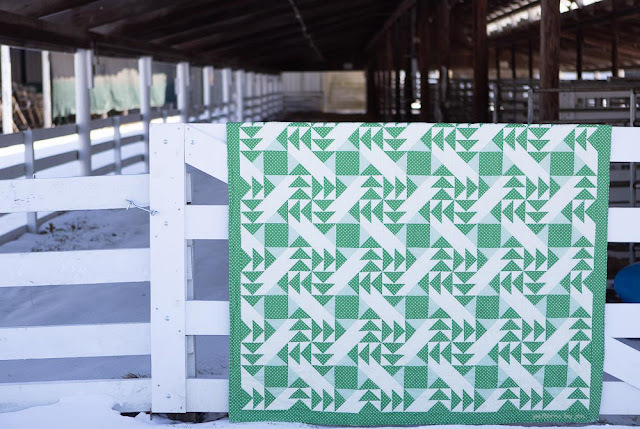 Thank you for stitching along with the 2019 Monthly Color Challenge! Have you ever struggled to add borders to a quilt because it's too big? 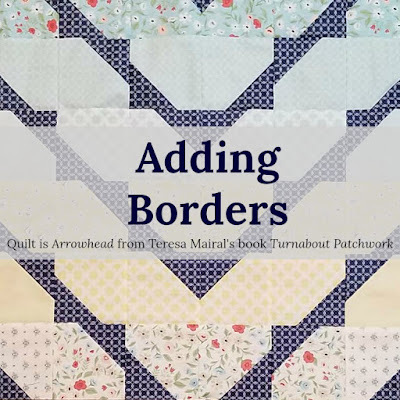 If you are new to quilting you might find THIS POST: Adding Borders helpful for cutting your borders. 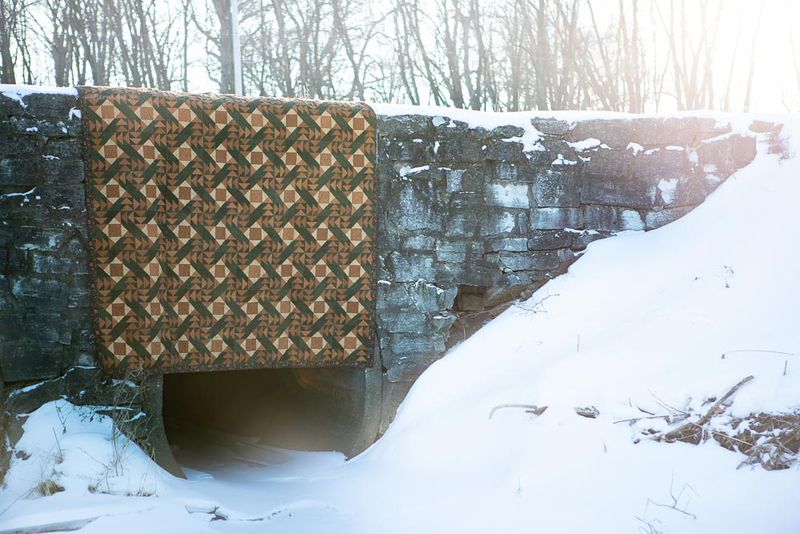 I use my rug for this trick, but you could use your bed if you don't have rugs or don't want to have to get up and down from the floor. First lay your quilt top flat on the floor. 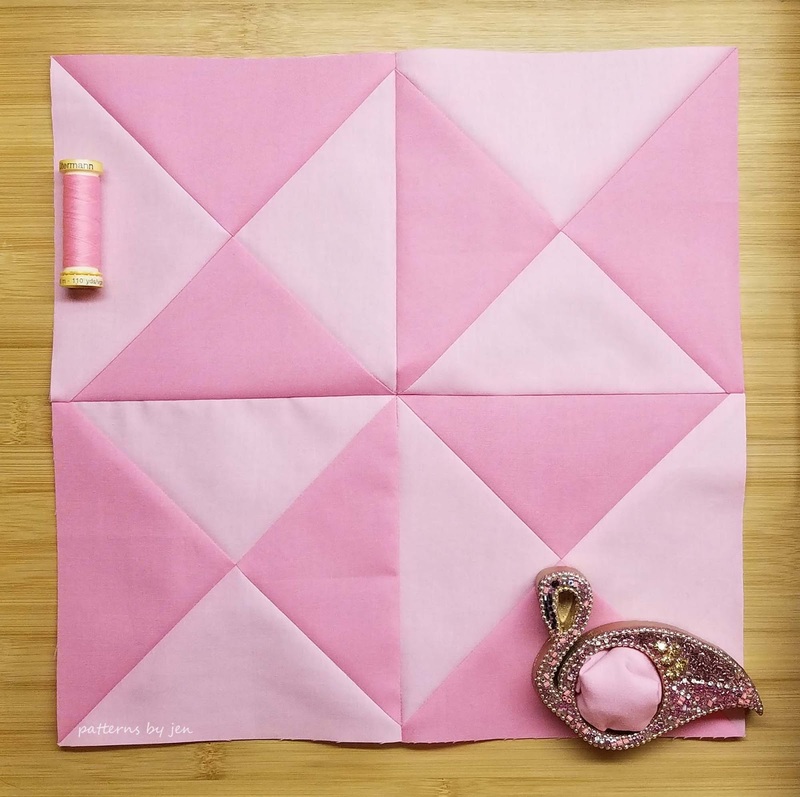 Smooth it out so there aren't any wrinkles or bubbles along the end that you are adding the border to. Pin each corner to the padding in your rug, then put a pin in the middle to hold it all in place. 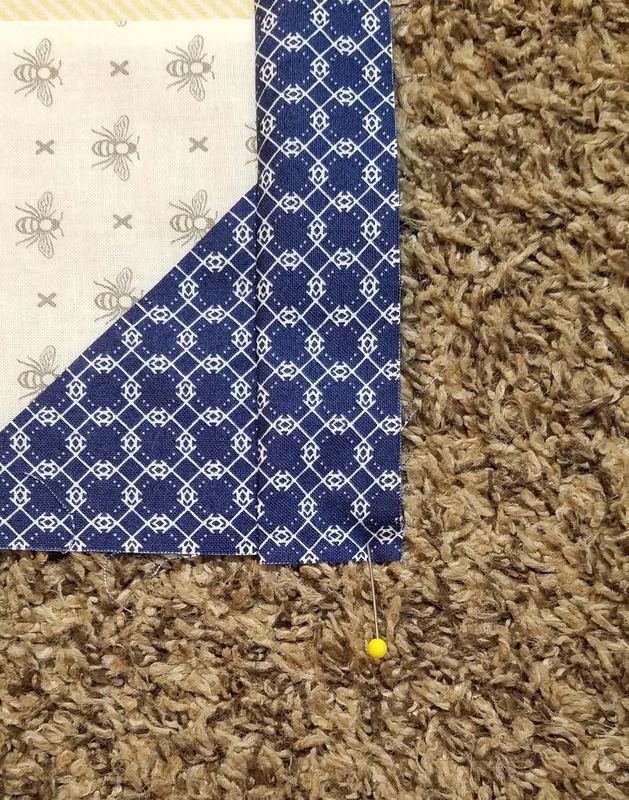 Lay your border down on top of your quilt, right sides together. Smooth it out so it is end to end. Pin the border corners to the quilt top corners. 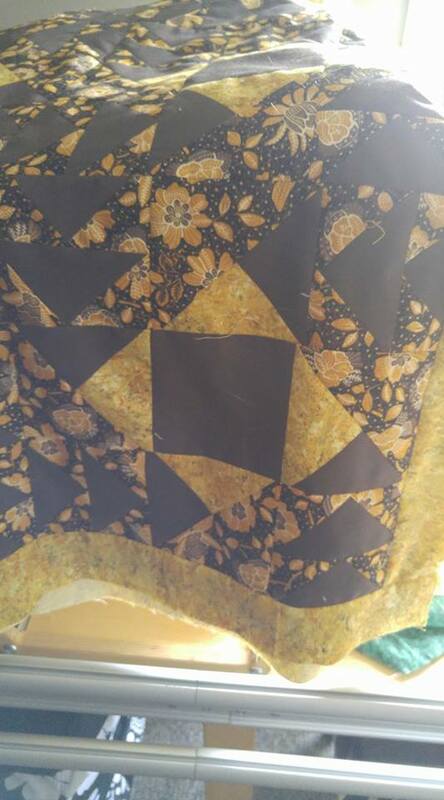 Put a pin in the middle and then a pin half way from the middle and each corner. 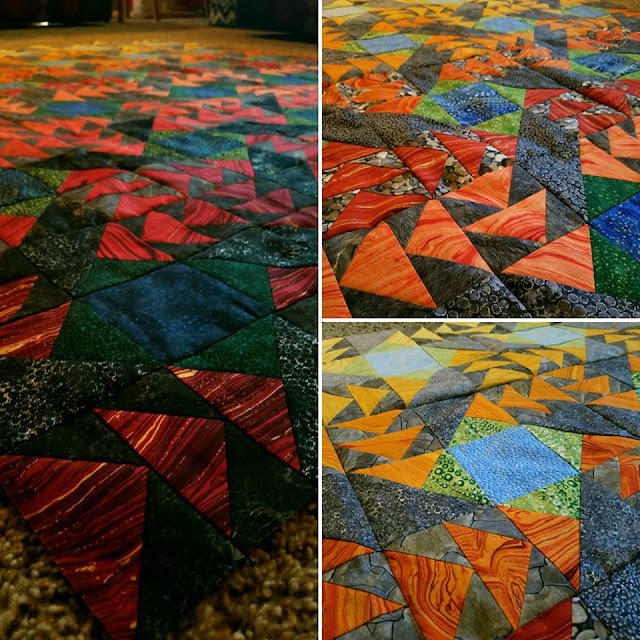 Unpin the corners and middle pins from the rug. I find that sewing with the border strip on the bottom is the best way to make sure it is sewn evenly to the quilt top. I hope you found this quick walk through helpful. If you have any questions, please leave them in the comments. 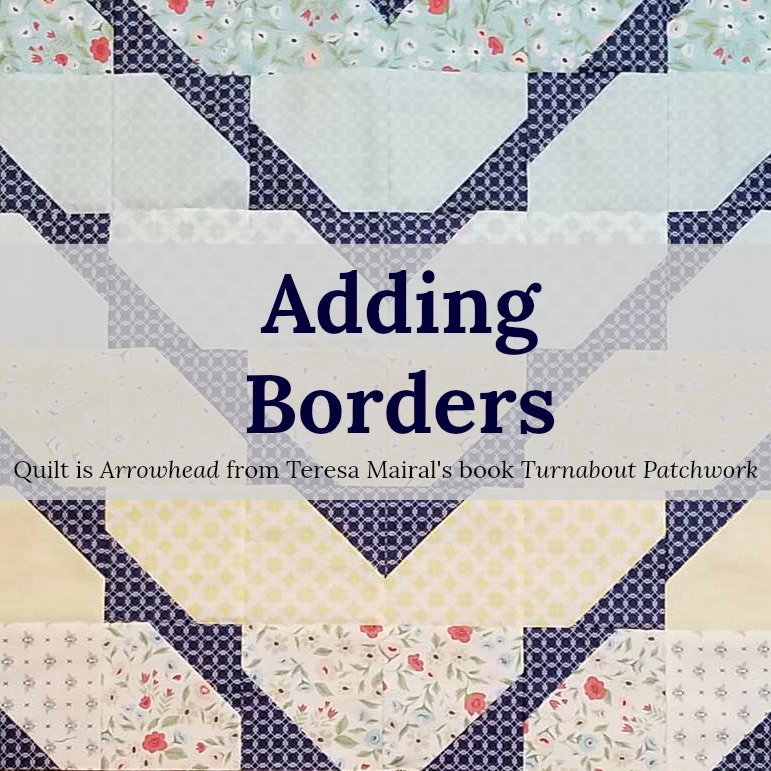 The quilt shown is Arrowhead from Teresa Mairal's new book Turnabout Patchwork. You can see the blog post I wrote about it HERE. Welcome to February's Monthly Color Challenge! If you are new to the 2019 Monthly Color Challenge you can hop over quick to read through the introduction and also see the colors coming up in the months ahead. This month you are digging through your stash for pink. 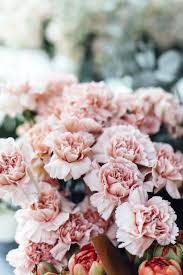 A few of my favorite pinks: pink carnations, pink Starburst, pink bubblegum, pink nail polish and of course pink flamingos! For a full ensemble of my tips for beginners see the Beginners Unite page. 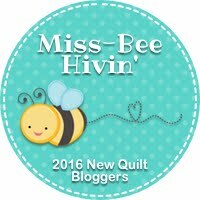 Make sure you visit their blogs, see their beautiful blocks and maybe even get some tips. While the Tucker Trimmer isn't required I wanted to show you a picture of it on the hourglass units we are trimming. 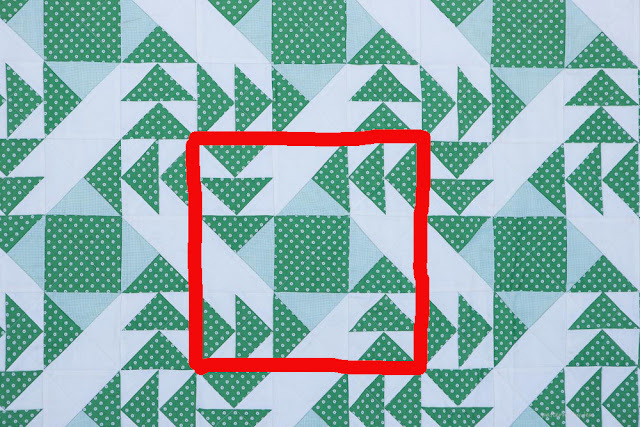 You can see how there are diagonal lines going both directions to help square up those units perfectly, without a lot of extra lines. In the February block instructions is a how to video on making the entire February block. In there I mention how my corner seams don't nest together, but if you take a moment to turn the blocks (making sure you don't lose the pattern) you can get it so that all the seams nest. It is my recommendation that you play around until you get those, because that will give you the points coming together in the middle, unlike the block in the video. Ha! 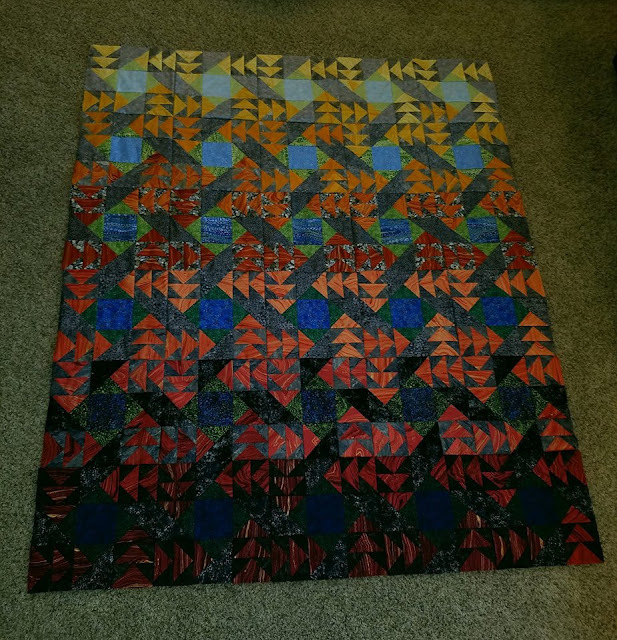 I never trim my blocks, but if you are a trimmer I recommend waiting until all of your blocks are pieced and then finding trimming them all at once. 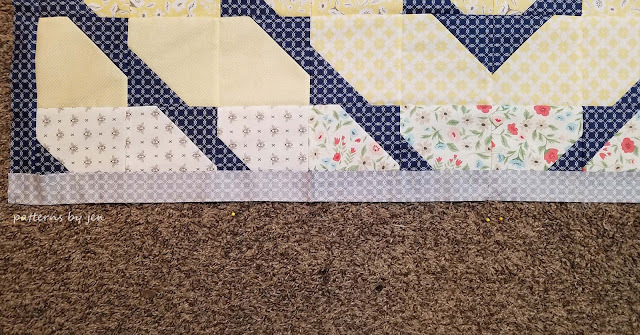 Your goal is 12 1/2" unfinished blocks. 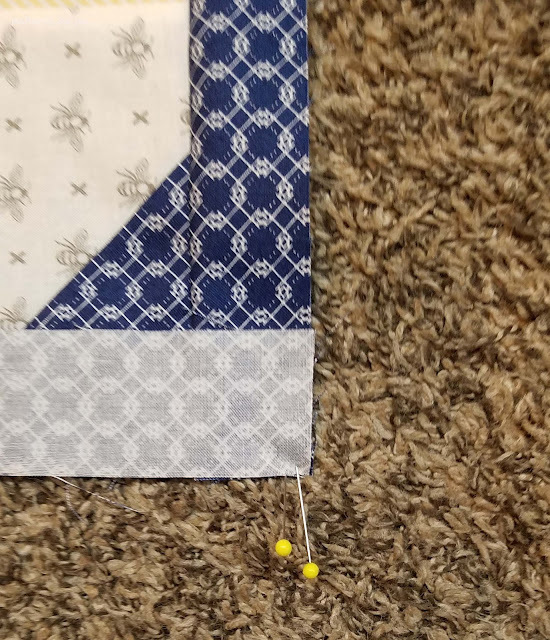 I don't trim because I don't want to lose my points and since we make the units that makeup the block larger and trim them down, you should be fairly close to the correct size. If you are off 1/8 of an inch or less I really discourage trimming. 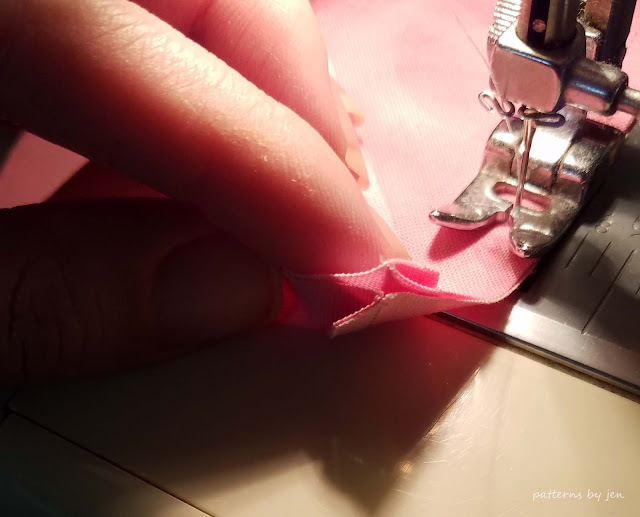 If you are off 1/4 of an inch then instead of trimming I would suggest taking a look at your seam allowance and cutting, because trimming will definitely cause you to lose the look of the block. 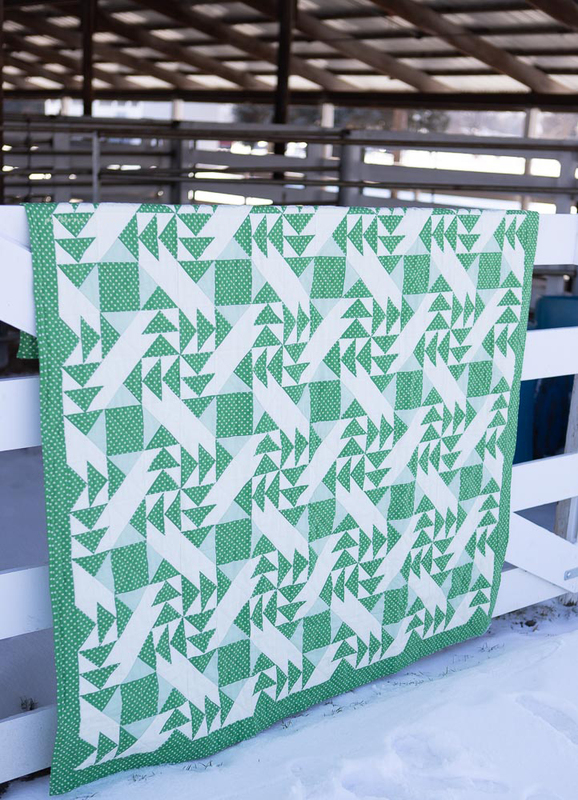 Ready for your free February Monthly Color Challenge block? Find it HERE. Remember there is a change this year and the block is available for free only through February 28th. 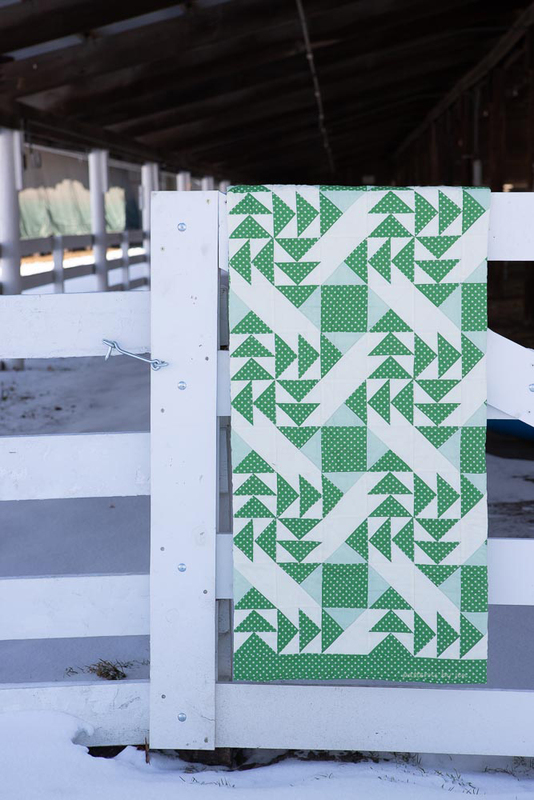 Use #2019monthlycolorchallenge on social media so we can see your blocks. **NEW** Each months set of instructions comes with a full video tutorial! To get the block instructions delivered right to your email sign up HERE. This will not give you January or February's block, you still need to go to Payhip and download those, but from this point on it will come directly to your inbox on the first of each month. Join the 2019 Monthly Color Challenge!